Three songs from Glee’s new episode next week have leaked! 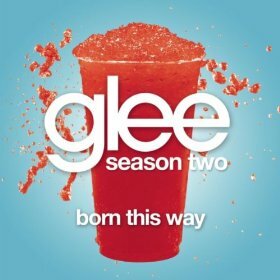 Edit: Added the Rachel and Quinn duet! Just added the Quinn/Rachel duet of I Feel Pretty/Unpretty. So good! They sound great! I consider this episode to be an answer to us fans who have been complaining about the lack of screen time given to Glee’s under appreciated cast members. The title says it all. A Night of Neglect. The kids need to raise money for their trip to Nationals in New York and Will would like them to sell taffy to do it. This isn’t Atlantic City Will. That’s not going to work. Artie, Brittany, Mike and Tina are all in a trivia club and have won the chance to compete in Detroit. They will also need money. Holly suggests putting together a benefit concert instead, giving the neglected kids of New Directions a chance to shine. Sue is comfortably plotting the demise of the club yet again and this time has enlisted the help of a small group of Will haters. Her Sue-per villains if you will. The group consists of Dustin, the coach of Vocal Adrenaline, Will’s ex wife, and the former coach of New Directions, Sandy. I appreciate this group of evil doers because I’ve really missed Sandy. 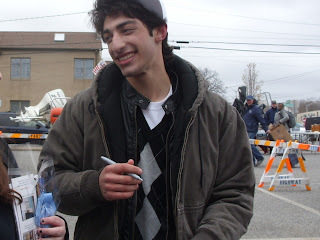 Someone put him in a room with Josh Groban please. And Cheyenne Jackson is so underrated. He was one of my favorite things about this episode. Sue asks him to break up Will and Holly but turns out that’s an easy job. When Will learns that Emma and Carl are getting an annulment, he wastes no time letting Emma know how willing he is to polish her grapes. Emma’s OCD is out of control from the stress. Poor girl. Ask Marc Summers for help! Speaking of characters returning, Sunshine is back. She shows up under the guise of wanting to help New Directions drum up publicity for their benefit with her 600 twitter followers but really, she’s evil. Doesn’t stop her from wanting to out sing all the girls on the show though and she performs All By Myself. Fitting really because she’s not making any friends after not showing up to the benefit. Her character is very confusing to me. Is she just on the show because of her voice? If acting doesn’t matter, where can I start a petition to get David Archuleta on the show? He has a fantastic voice even if he’s awkward. Lauren encourages Mercedes to demand respect from the rest of the club. Embrace the diva. She begins making ridiculous demands of her fellow glee clubbers if they want her to perform. I don’t really understand how drying your hands on a Pomeranian is practical. I’m looking at mine and it just seems messy. Somewhere before demanding being carried in to the show in an egg ala Gaga, Mercedes has a heart to heart with Rachel over always being outshined by her. Looks like the kids are playing to an almost empty room. The only people in attendance are Sandy and his group of hecklers. Kurt and Blaine show up as well after having a heated confrontation with Karofsky where Santana Shuts. Him. Down. Damn. Get it girl. Tina is up first singing I Follow Rivers but runs off the stage halfway through in tears from the hecklers. Holly is up next singing one song too many with her choice of Turning Tables. Mercedes then brings the house down with Aretha. She got her respect and isn’t giving it back. Even Sandy falls in love with what he’s hearing. Even though their benefit was a bust, Sandy donates the money they need. I hope he comes back. Someone call Josh Groban. 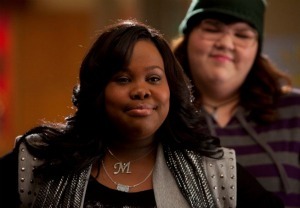 Puck: Is it because two of them are Asian and Artie wears glasses? Santana: You stay here and I crack one of your nuts. Right or left. That’s your choice. ..Or attempts to anyway. 🙂 In honor of the 90’s classic tv show Boy Meets World finally getting released on dvd again, I thought I’d dust off this video I took backstage of Kris Allen paying homage to the best show ever. Follow Danielle Fishel on Twitter because she’s awesome! New Song From Kris Allen! 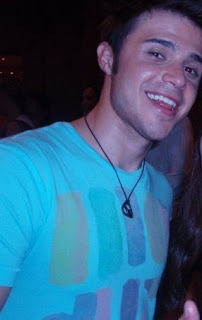 Some very lucky fans got to see Kris Allen at The Viper Room where he debuted a new song! Kris, or should we say his band’s alter ego Sirk and The Dirty Minds, showed that they have the chops to go into country with this song. What do you guys think? Thanks to Ocamy24 for the fast upload! His fans thank you. 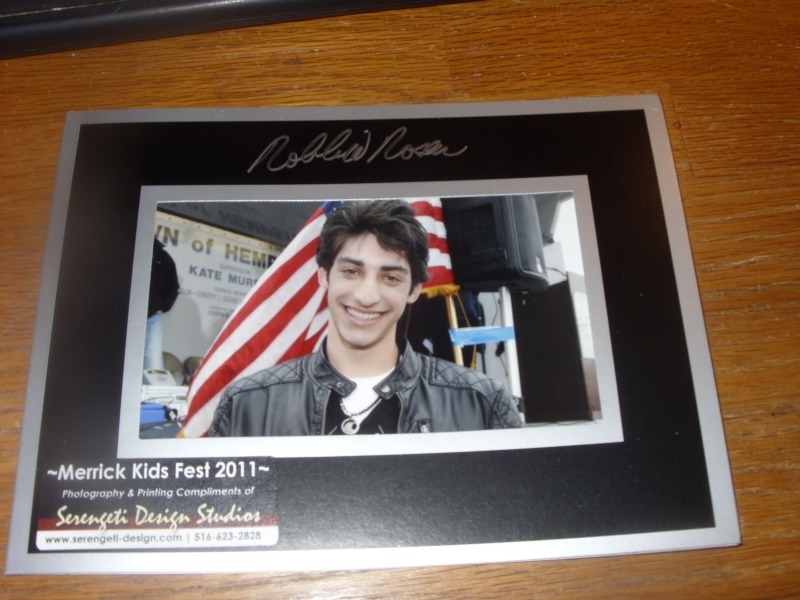 The Long Island community got together to honor Robbie Rosen on Saturday and I was lucky enough to attend. I took pictures and video of his performances and my opinion on him hasn’t changed. Robbie was Robbed! I’ve long thought Robbie had one of the best vocals on American Idol this season but a lack of camera time and the show’s need for a girl to finally win, ultimately didn’t work in his favor. 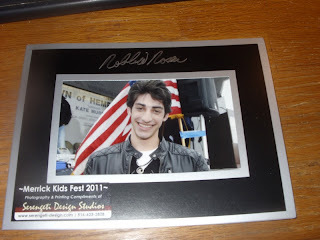 Robbie and his family were extremely kind, humble, and thankful for everyone who braved the extreme weather to see him. And believe me, it was cold. I watched Robbie’s performances and before I knew it, an HOUR LONG line had formed to meet him. I can only imagine what it would have been like had it been a sunny day. I have to say it was worth the wait. Robbie was amazing, giggly, and very humble as I prodded him to tour so we could all see him again. Then I got myself a hug and thanked Robbie for following me on twitter. I have no shame. It’s American Idol’s loss and Robbie’s talent will surely take him somewhere even better. Robbie’s dad in the beginning is my favorite part.